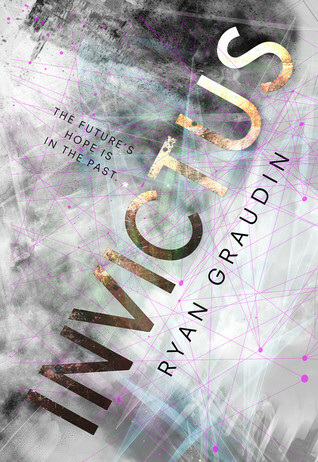 I've read all of Graudin's previous books (two with HarperCollins, three with Little, Brown), and I've enjoyed them all. I had no doubt that I would enjoy this new book. It is quite different compared to the others, with the subject matter being time travel, and I'd been looking forward to reading it since the announcement about the book was made. This book got off to a slow start, but I enjoyed it very much! Farway Gaius McCarthy - better known as Far - was not born in a time that he should have been. His mother was in between time periods when he was born, and nothing could be done about this. Seventeen years later, Far is taking exams to progress in his time-traveling career, and he is expected to pass with flying colors. But something goes wrong, and he is expelled. His expulsion is cruel and unjust, but he isn't out of options. He accepts a position as captain of a ship (which he names Invictus), smuggling rare goods from the past before they are destroyed. The heists go very well, especially with the exceptional crew Far has chosen. But a heist on the Titanic proves to be a disaster when a mysterious girl shows up and demands her way into the crew. Everything seems to unravel with the appearance of this girl, and Far discovers that nothing about his life is as it should be. Time-travel stories can be hit or miss for me. My favorite series is the Ruby Red trilogy by Kerstin Gier - that was a fun and intriguing series, entertaining from start to finish. Other time-travel stories have been boring and confusing. So I'm always wary of new ones. But when I saw that Ryan Graudin was writing, I didn't really think twice about the content of the story. I trust Graudin's storytelling and I had a good feeling about this book. From the start, I adored Far. He is confident and a little arrogant, but not in an obnoxious way. There is something entirely endearing about him. He's the kind of hero that you love without having to know why. But there are so many good qualities about him - his persistence, his determination, his fearlessness, his selflessness, his confidence. He has an interesting sense of humor and he is a fun guy to follow. While this story isn't just about him, it definitely wouldn't be the same with him as a lesser character. He is a very fun and well-written protagonist. Arguably, all of the crew are primary characters. This book is written in third-person POV, and it seems like the majority of the story is told from Far's third-person POV, but the POVs of other characters are common. Gram, the Engineer of the Invictus, is a constant presence. He is incredibly smart and logical, which makes sense since he is the one that does the calculations to perform the jumps in time. Imogen, Far's cousin, is the Historian of the crew. She is responsible for knowing about the details of the historic periods of time (for costumes and such). Priya is a medic, which is kind of necessary since Far gets into scrapes every now and then, on heists. The newest addition is Eliot, who is the mysterious girl who came out of nowhere on the Titanic. She is very strange and not someone I trusted at any point in the story. Her identity is revealed very slowly, so you're left wondering who she is for a bit in the story (though all is revealed, don't worry). Her plans were unknown to readers at first, even though we read from her third-person POV occasionally. We can't tell if she is friend of foe, but she is a very important character in the story. There is romance, and I loved it because it is already established romance. Far and Priya are already dating, which is cute. Usually YA stories do the meet-cute thing, in which the two characters meet and go on adventures together. In this case, Far and Priya had already known each other, and started dating, in the early heists (long before problems with time traveling and Eliot arrived). There is NO love triangle. The arrival of Eliot does not signal a love triangle. I promise! There is also another couple whom I shipped (you can probably guess who). No love triangle there either. Far and Priya are the cutest, as are the other couple. Neither romance is very important in the story, though both are there are both are adorable. The time-travel aspect is not at all confusing or poorly explained. Even if you're not a mathy/sciencey person, you'll be fine when following the explanations and whatnot, when it comes to time travel and anomalies and such. The big conflict deals with a rift, and the author makes sure readers know how and why and what. Things didn't make sense at first, but as the author revealed more and more, things started to come together. By the climax of the story, everything becomes clear - who Eliot is, why Far is critical to the huge problem, what happened to Far's mother, and so on. Many questions are answered. The end of the story is a little sad at first! Certain things are unavoidable, and so the ending had a bit of a bittersweet tone to it. BUT. It doesn't end that badly. In fact, the ending is hopeful and somewhat of a HEA, even if it isn't truly a HEA. It's a good ending, overall. This exciting and heart-pounding science fiction novel is perfect for anyone looking for adventure and high stakes. Cute romances and great friendships make the novel even stronger! I love science fiction but often struggle with time-travel novels, but I definitely recommend this book! It is fun and interesting, with high stakes and nonstop action and intensity. I loved following this crew, with their strong bond and friendships. This is a standalone novel so you wouldn't need to worry about waiting for another book to follow. 4 stars. I have yet to be disappointed by Ryan Graudin! All of her stories are so unique and different, and there is a lot to love about each book. I can't wait to read what she comes up with next! I enjoyed this one quite a bit too. The character dynamics were my favorite. But omg, yes! I had a hard time trusting Eliot too. I don't think I ever quite did. That ending was quite sad, but it seems this author doesn't like to tie her endings up with a nice bow. It surprisingly worked for me! I have had this on my TBR for awhile, and this review made me super excited! I'm like you and sometimes I struggle with time traveling novels, but this one sounds so interesting I thought it would be worth the try. Glad to hear you enjoyed it so much. I've never read anything about Graudin but curiosity got the best of me at ALA so I snagged a copy. It sounds like everything I would love; I did expect a meet-cute situation though! AND THE TIME TRAVEL ISN'T CONFUSING? PRAISE. I'm so excited for this one! I need it! I'm glad it was an enjoyable read, and yay for no love triangles! I also like that Far had an established relationship already. This one sounds so great and I still adore the cover! The more I hear about this, the more I want to read it! I'm really happy to hear that Far is already in an established relationship and that there's no love triangle -- that will be a refreshing change. Awesome review, Alyssa! Hope you're having a great week! I still need to read the two Graudin books on my shelf and yet, this one is calling to me, too. Can't wait to read this one! Too many books on my plate, I have a few more to knock out until I can get to it, but oh it will be done! I love time travel stories so I am really looking forward to reading this one. I am so glad to hear that you enjoyed it. Great review! Oooh, established romances are quite rare but I love them. I have this one coming up on my reading schedule and I can't wait!